Designed for practicing scientists and engineers interested in polymer rheology science, education, consulting, or research and development, Introduction to Polymer Rheology is a comprehensive yet accessible guide to the study of the deformation and flow of matter under applied stress. Often considered a complicated topic for beginners, the book makes grasping the fundamentals of polymer rheology easy by presenting information in an approachable way and limiting the use of complex mathematics. By doing so, this introductory overview provides readers with easy access to the key concepts underlying the flow behavior of polymer melts, solutions, and suspensions. Incorporating sample problems that are worked through and explained on the page, as well as numerous practice problems to gauge learning comprehension, the book prepares new students and practitioners for moving on to more advanced concepts. 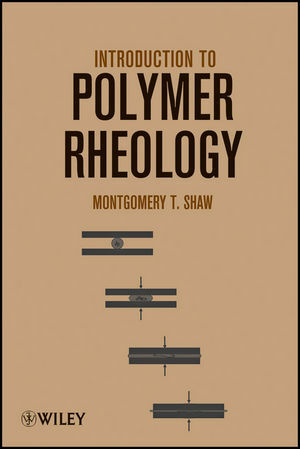 Comprising twelve chapters, the book covers stress, velocity and rate of deformation, the relationship between stress and rate of deformation (Newtonian fluid), generalized Newtonian fluids, normal stresses and elastic behavior, experimental methods, small and large strain, the molecular origins of rheological behavior, elementary polymer processing concepts, quality control in rheology, and the flow of modified polymers and those with supermolecular structure. The essential reference for accurately interpreting polymer rheology data, Introduction to Polymer Rheology provides readers with an elementary understanding of the key issues and modern approaches to resolving problems in the field. An Instructor’s Guide with answers to select problems in the text, 60 new problems with full solutions, hints for effective presentation of the material in the text, and an errata listing is available for professors using the book as a course textbook. Montgomery T. Shaw, PhD, is the DiBenedetto Distinguished Professor Emeritus at the University of Connecticut in Storrs, Connecticut. He is a coauthor of Introduction to Polymer Viscoelasticity, Third Edition, also published by Wiley.